Bible publishers churn out Bible products, which are marketed to people of every age and stage, from businessmen to Busy Moms. There’s the Bride’s Bible and the MANual. 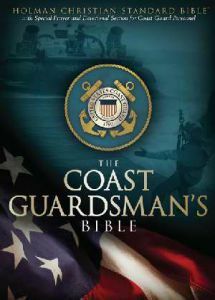 There’s the Firefighter’s Bible and there’s the Coastguardsman’s Bible — part of the Heroes Series, specially designed for each branch of the US military! Each of these products depends on extra features, like quotes, tips, and visuals, all of which are supposed to make the Bible more accessible. Red-letter versions have been succeeded by green-letter versions. We’re constantly fiddling with Bible design. The thing is, these Bibles don’t make for easy reading. All the added bits steer us away from reading the Bible, and leave us reading about the Bible. It’d be great if we stopped adding stuff. But the problem goes deeper than your local Christian bookstore, because we’ve been adding stuff to the Bible for generations now. The Live light in 25 words campaign is about kick-starting a Bible reading habit (what an excellent thing!). The idea is to read a verse each day. But is reading a verse the best place to start? When you look at a Bible page — on a digital device, too — you’ll find a page covered with numbers. Those numbers weren’t originally there, but they can come in handy for locating and referencing things in the text. But the numbered chunks — the verses — don’t often have much to do with the Bible text itself. Verses tend to be pretty random, and it’s especially pronounced in the New Testament — maybe because the verse divisions were added during a road trip. Take the book of Ephesians, originally made up of about 65 sentences (in Greek), but now pulverised into 155 verses. As you might guess, this can cause problems for understanding the text, but at this point I’m more concerned about the way verses affect our reading experience. Would you try to understand a newspaper one line at a time? Or a play? Or a poem? You wouldn’t even bother. It’s nonsense! Why would we ever expect verses to help us read the Bible? Our Bibles, dotted with all those numbers, look more like textbooks than anything. The two columns. The cross-references. The headings. The chapter and verse numbers. A textbook page is designed for accessing information, with bullet-points, pull-out quotes, charts, and footnotes. In the same way, our Bibles are packed with additions that constantly force us to stop and study instead of to read. Reading a verse a day might be a good place to start, but it’s a terrible place to stay. Where to from here, then? More than perhaps anything else, verses are what makes Bible reading a slog, a chore, an uphill battle. Bible reading really starts when we start ignoring the numbers. Unfortunately, tradition can give us mixed messages. As evangelicals, placing a high value on the Bible, we talk a lot about ‘reading in context’. Bible verses, we’re quick to say, must never be taken on their own. And yet, something in our evangelical heritage has trained us to do exactly that. The Quiet Time gene encourages us to treat the verse as the basic unit of comprehension, and that leads us to expect that the Bible is more meaningful in small pieces. We act as if the Bible is best taken a verse at a time — and it’s fine to stop after three or four. But we can do better than that. And we must. The Bible isn’t a collection of principles, but a library of books. Instead of trying to live on vitamin pills, let’s have the 66-course banquet! If we refuse to see the Bible as a reference book, the way is open for us to decrease our dependence on study Bibles and begin using a reader’s Bible. A reader’s Bible is a more organic, additive-free Bible. It’s simplified rather than ‘enhanced’. It’s designed to give a reader the most immediate and uninterrupted experience of the text. If you find the Bible hard to understand without study notes, the first thing I’d say would be, Have you given it a red hot go? I reckon you’ll be surprised by how much you naturally discover — especially if you’re exploring it alongside others. A great example of a reader’s Bible is The Books of the Bible. Its pages look more like a those of a novel: there are no headings, no footnotes, no cross-references, and no chapter and verse numbers. The text is in single column, and the paragraph breaks reflect the literary flow of the text. Biblica, the creators, are by no means the first to create a reader’s Bible (check out The Bible Design Blog). And this one won’t be the last, either — in fact, you can create your own reader’s Bible, as I’ve done over the last couple of years for use in small groups. But The Books of the Bible is the first reader’s Bible that could change our expectations on a mass scale. Get yourself a copy, and get one for a friend. (If you’re in Australia, it’ll appear next month.) Start using it. Make it your everyday Bible. Consume it, absorb it, live it. These are words of life! I’ve really benefited from this series on Bible reading and spending time with God. Thanks for posting about it. I’m interested in The Books of the Bible and have been since you mentioned it in a previous post. I was thinking about ordering a copy through WORD (which they told me will take 4-6 weeks). If they’re coming out in Australia in a month (how do you know these things?) I may as well just wait. Do you know where I can get one when it comes out in Australia? I would assume WORD since they’ve already got it as a special order on their website. It arrives in Australian stores in November — I think I found out through their Facebook page. It’s listed on the Koorong site too. The copy I’ve got is an earlier version that came out in 2007. 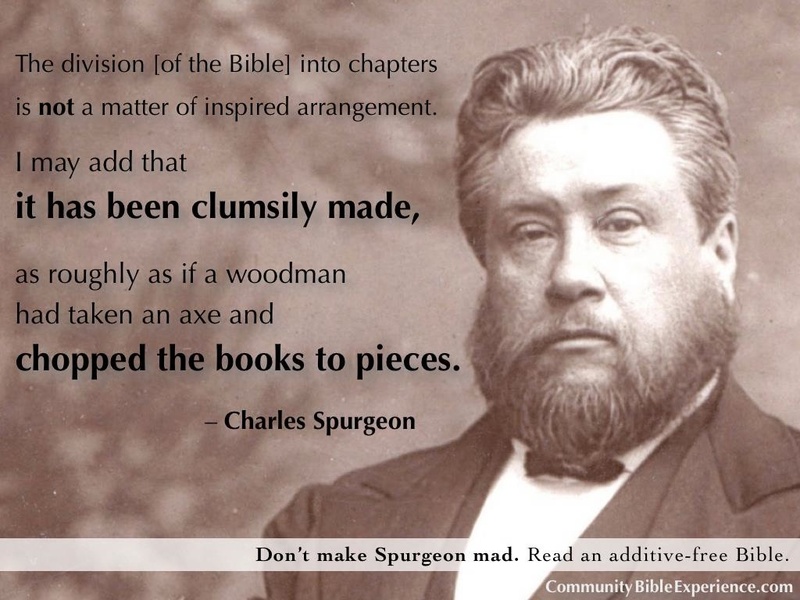 I agree that verse and chapter divisions are not inspired and at times can cause breaks in the context that are harmful for correct understanding of a passage. At the same time verse and chapter divisions are extremely helpful in group or church settings in finding the same location in the Bible. As far as study Bible helps go, the subject could be argued back and forth. I personally have access to a number of commentaries that I would normally use instead of study Bible notes. That said, I do consult the NET Bible and especially the Key Word Study Bible for Greek tenses. As a pastor and a Bible Institute graduate, a Bible college graduate with a major in Bible, and a seminary graduate with a masters degree in theology I realize there are things I still don’t know. I have study tools available to me that many Christians do not possess. For them a study Bible may be of great benefit. Of course they need to be aware that the notes are not part of the inspired Word of God, they are just the opinion of one or more people. To properly interpret the Bible we need to understand the culture or the time in which it was written to at least some degree. In addition, there are areas in the original languages that are not properly brought out in English translations (sometimes due to the difficulty of expressing the thought due to differences in English grammar). Also, the passage may have more than one legitimate way the original language may be translated or understood. Bible study aids whether as part of a study Bible or in a separate format can be of great benefit in accurately dividing the Word of Truth. We should be looking first for what does the Bible actually say and then afterwards for what does it have to say to me. Thanks for commenting. What I’m referring to is our dependence on study notes. It’s not as if they’re useless, but the point at which we feel unable to approach the Bible without them is probably the point at which these helps have become a hindrance. What I mean is that our accurately interpreting this or that passage doesn’t necessarily lead us to know the Bible better. We’re certainly in need of accurate interpretation (and would God give his church more scholars! ), but we’re also in need of absorbing the text as readers and hearers. As you say, we must see what the Bible actually says — but we need awareness and breadth, not simply accuracy and precision.